See 3D TV for yourself at Panasonic's UK roadshow | What Hi-Fi? 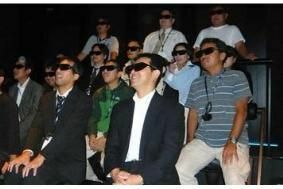 Shoppers will be given a preview of the 3D content currently available, as well as the technology that Panasonic is developing to bring Full HD 3D TV into your home. The 3D TV roadshow will take place in nine UK cities from October to December, showcasing Full HD 3D videos and movie trailers using Panasonic's latest Neo PDP Full HD TV technology and Viera Cast, which enables the streaming of HD content from the internet onto a TV screen. Keith Evans, Panasonic UK's managing director, says:" 3D television will be an entirely new experience for consumers, and we are really looking forward to getting out there and showcasing the future of home entertainment directly to the general public." The company remains committed to making Full HD 3D TV and 3D Blu-ray products available to consumers by next year, although specific launch dates remain vague. And don't forget we'll be reporting from the CEATEC Show in Japan next week, where Panasonic will demo its prototype 50in Full HD 3D plasma TV. We'll bring you more details when we get there.